Welcome to The GLOBE Academy! We are so glad you are joining our community. Below are tips and resources to help your transition to GLOBE. Susan Mellage, Admissions Director, is your guide at GLOBE. Please contact her (sjmellage@theglobeacademy.net or (404) 464-7040) with any questions and she will direct you to the right person. Familiarize yourself with school policies and procedures by reading the Family Handbook. You will find our calendar, staff directory, afterschool and summer camp information and more! Find the daily schedule and GLOBE calendar here. We recommend subscribing to the calendar so you never miss an important event! To subscribe, view the calendar. In the top right corner, click Subscribe and choose your calendar program. Visit our Parent Teacher Community Council's website and register by clicking "Login/Register" at the top left corner. It's a great place to find volunteer opportunities, parent directory, and more. The best way to get involved, meet staff & administration, and make friends at GLOBE is to volunteer! No matter your work or family schedule, you'll find a way to get involved. Find Volunteer Opportunities here. Head of School, Christi Elliott-Earby sends out periodic reminders via text message about important school events and school closings due to inclement weather and other emergencies. Subscribe here. You can apply for Free/Reduced lunch through DeKalb County Schools Office of School Nutrition. Registration for 2018-19 via the online application is now open. If you already receive lunch benefits through DeKalb County, you will need to renew your application each year. You can apply for free & reduced lunch benefits any time of year. Please contact Jen Parker at the Lower Campus front office with any questions or if you need assistance with your application. Follow The GLOBE Academy on Facebook. The PTCC also hosts several informal groups for information and Q&A. Upper Campus Facebook Group for Grades 4th-6th. These are closed groups. Request membership from the Admin with your child's name and grade. Acceptance of new families for the new school year begins July 1. Your room parents may also organize other social media sites to keep in touch with other parents in your grade and language track. Need to organize a ride to/from GLOBE? Check your back-to-school email for links to the carpool connector or contact Susan Mellage for the link. Some parents hire outside providers for transportation. You can find a list of these providers here. Show your school spirit! 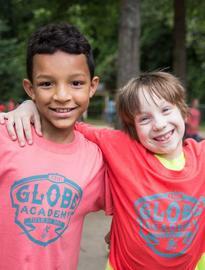 Stock up on GLOBE t-shirts & sweatshirts for kids and adults, car magnets, tote bags, and more! Order online and pick up in the front office of Lower or Upper Campus. The PTCC hosts several Spirit Wear sales throughout the school year. Look for their table at carpool Pop-Up Sales, Family Summer Picnic, Orientation Day, International Fest, and other school events. Jackets get left on the playground and water bottles are left on the lunch table. In a few weeks our Lost and Found is overflowing! Make sure your child's belongings are returned by labeling them with his/her first and last name. Many parents use Mabels Labels to tag their clothing, backpacks, and more. Use this link and Mabels Labels gives a percentage of your order back to GLOBE. Whether you are packing lunches, sending food for teacher appreciation, or bringing a potluck dish, always remember that The GLOBE Academy campus is nut-free.